Sheraton Myrtle Beach is not currently available. 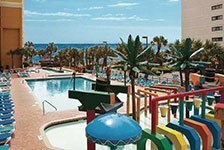 Check out our other great Myrtle Beach Hotels. 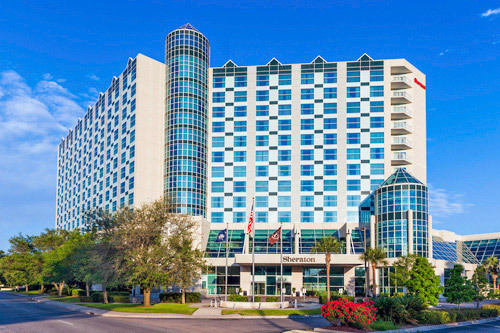 Conveniently situated in Myrtle Beach’s central business district, the contemporary hotel offers 400 sophisticated guest rooms, modern amenities and an ideal location near popular area attractions. 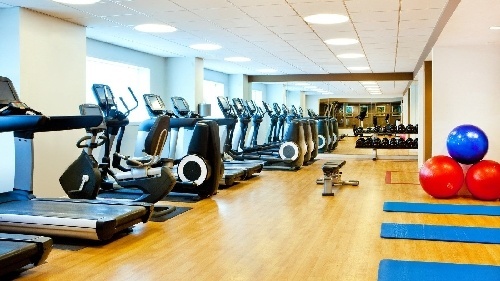 Guests can enjoy complimentary Wi-Fi, an indoor heated pool, a state-of-the-art fitness center, a club lounge, and exceptionally close proximity to Broadway at the Beach, just four blocks away. Located 0.5 miles from the beach, 1 mile from Broadway at the Beach, and 4.1 miles from Myrtle Beach International Airport. 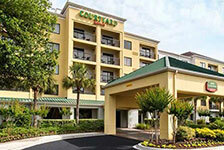 Situated adjacent to Myrtle Beach Convention Center. Minimum age to check-in is 18. 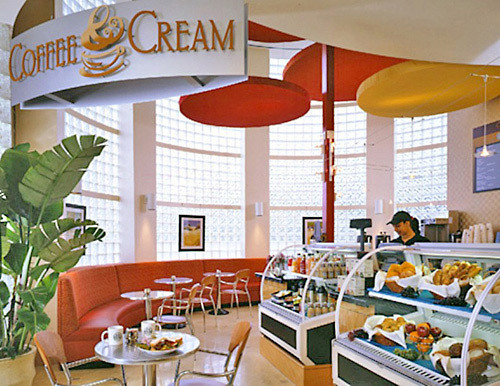 Dine at the restaurant, coffee bar and lounge on-site. 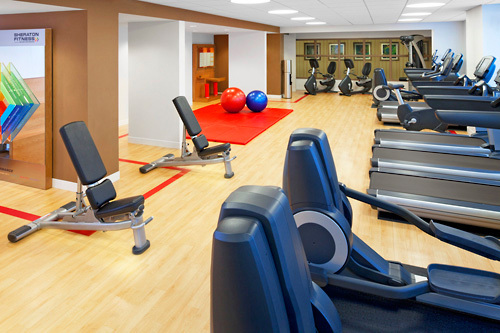 Amenities include a state-of-the-art fitness center and an indoor pool. 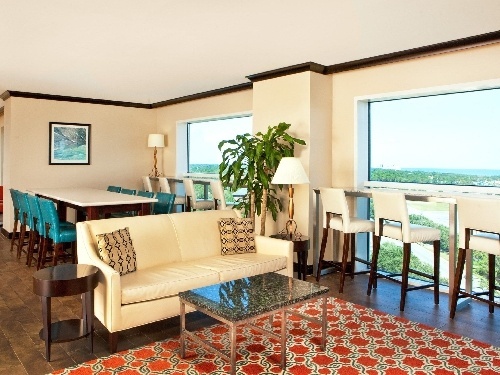 Flat-screen TVs and microwave in-room for guest comfort and convenience. 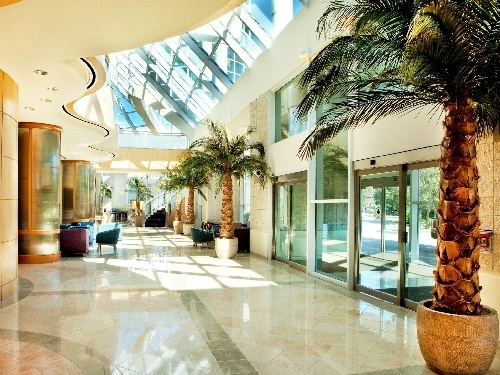 Welcome to the Sheraton Myrtle Beach Convention Center Hotel, Myrtle Beach's premier hotel. 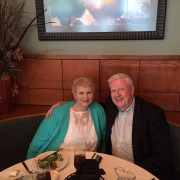 Our convenient location gives you easy access to the best the area has to offer – we're just three blocks from the ocean and four blocks from Broadway at the Beach, Myrtle Beach’s largest entertainment complex. 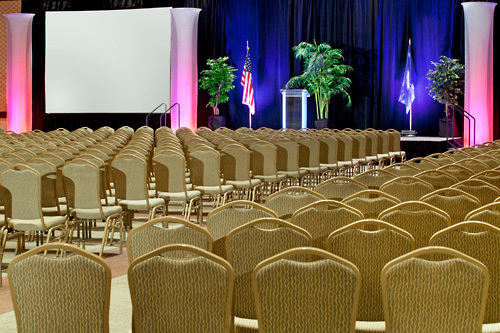 Plus, we're only 10 minutes from Myrtle Beach Airport and we're conveniently attached to the Myrtle Beach Convention Center, offering a combined total of 200,000 square feet of conference space. 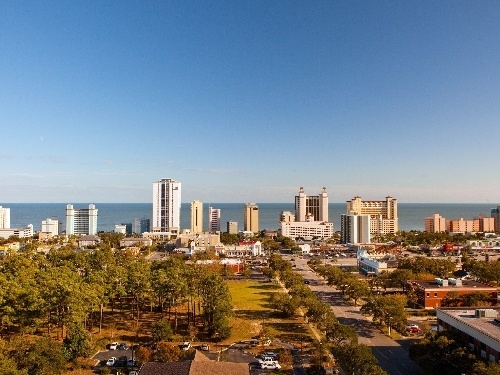 Situated in Myrtle Beach's central business district, we are within steps of all Myrtle Beach has to offer. Sunbathe, stroll, swim, or fish on the wide beaches of the Atlantic Ocean. Or enjoy unique shopping, casual dining, a variety of attractions, and exciting nightlife at Broadway at the Beach. Coastal Grande Mall, one of South Carolina's newest and largest shopping complexes, is just 10 minutes away. Myrtle Beach's finest golf courses are within a 10-minute drive as well. 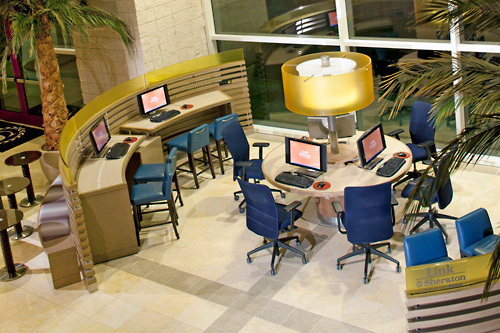 Plus, enjoy free WIFI while staying at the Sheraton Myrtle Beach Convention Center Hotel. After an exciting day of activity, relax in our first-class hotel where friendly service and a contemporary design await you. 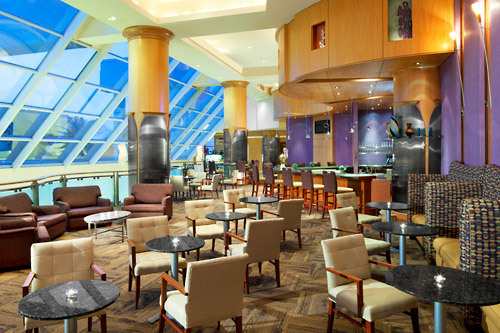 Enjoy dinner in Vidalia's Restaurant or an afternoon cocktail at M-Bar, offering complimentary wireless high-speed Internet access. Find total comfort in our 402 spacious guest rooms. Stay connected to those at home or at work using the high-speed Internet access. 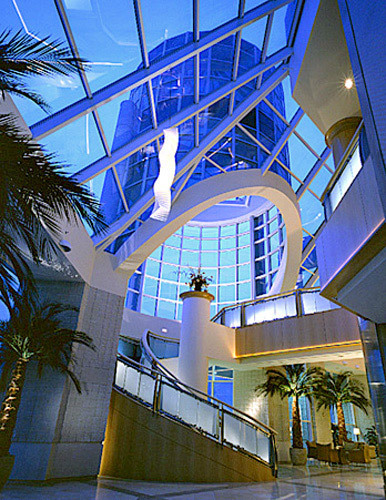 The best of Myrtle Beach is just outside your door at Sheraton Myrtle Beach Convention Center Hotel. 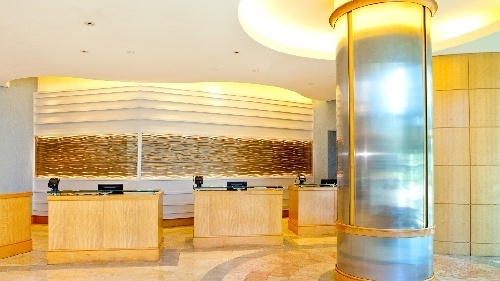 **Guests must have a valid credit card number at check in. *Self-parking is $8 plus tax per night. How many rooms are available at Sheraton Myrtle Beach? There are a total of 400 rooms available at this property. 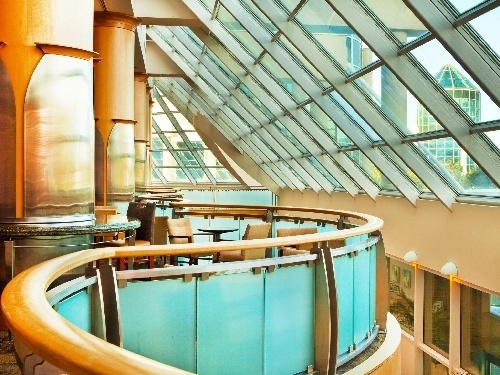 How many buildings comprise your units at Sheraton Myrtle Beach? The units are all located in one building. 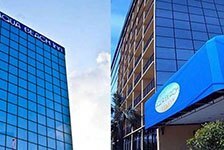 How many floors constitute the Sheraton Myrtle Beach Hotel? There are a total of 12 floors. 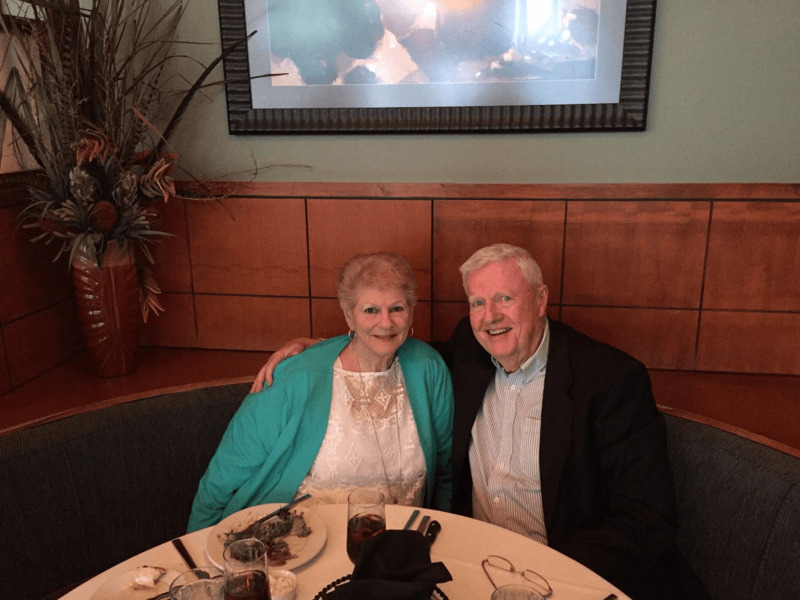 How many adjoining rooms are available at Sheraton Myrtle Beach? There are a total of 60 adjoining rooms at this property. 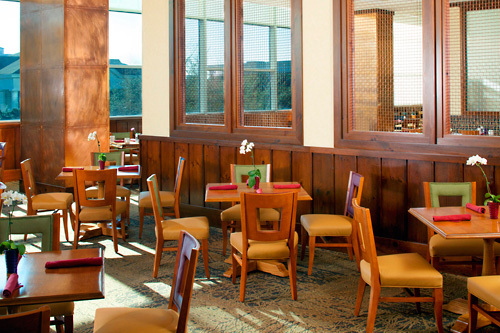 Vidalia’s Restaurant is open from 6:30 am – 2:30 pm; 5:00 pm – 10:00 pm. 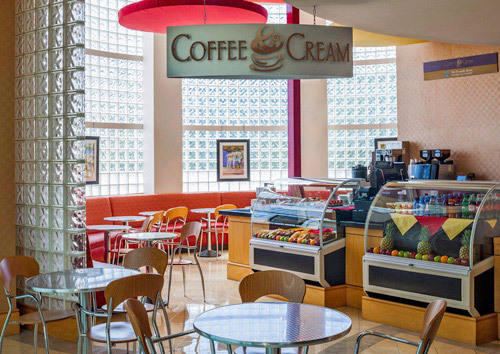 Coffee & Cream is open from 6:30am – 1:00 pm. The M-Bar is open from noon – midnight. There is also a gift shop open from 7:00 am – 10:00 pm. 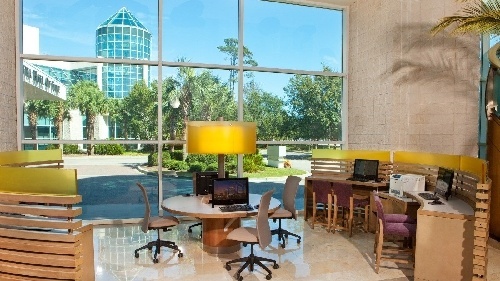 Do you have a minimum age required for check-in at Sheraton Myrtle Beach? Sheraton Myrtle Beach does not charge any resort fees. 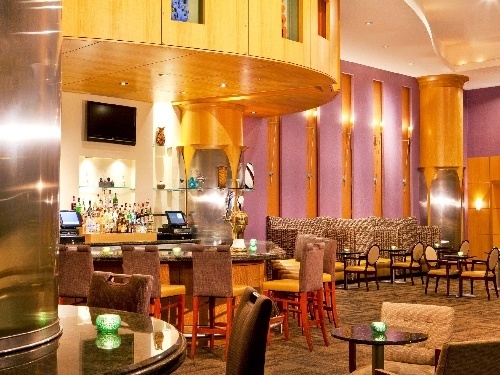 Do you charge for cribs, rollaways, microwaves or fridges at the Sheraton Myrtle Beach Hotel? Cribs are free of charge. Rollaways are $25 for the length of stay. Microwaves are $10 for the length of stay. There is no charge for fridges. 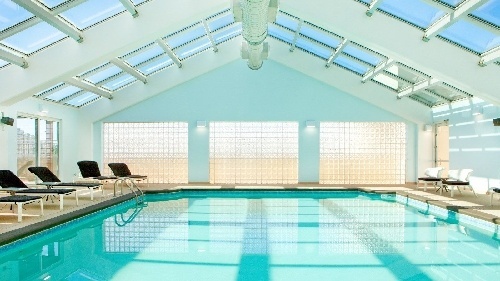 What are the pool hours at Sheraton Myrtle Beach? The pool is open from 6:00 am – 10:00 pm. What type of parking is available at the Sheraton Hotel? Parking is available at the attached convention center for $3 per night or guests can park in the hotel garage for $8 per night. Valet parking is $12 per night.